Many people have dreams of purchasing a new boat. These dreams come true, but they are required to move and relocate to a new state, it becomes a daunting task, shifting their boat to the new location. But gone are days when people were feared of damaging their boats while moving them from one location to another as there are many boat carrier companies which are expert in shifting any heavy vehicle from even the store to its final destination. Especially moving a boat on the land has no fear of getting the boat sink but there are many other hazards which may depreciate and damage the dream boat. Always go with authorized boat company- Having the correct authority is a must with the carrier company. The so selected company must be registered with the Federal Motor Carrier Authority and the Federal DOT. It becomes mandatory to verify your carrier by their MC and DOT license numbers for considering the safety and security of the shipping move. Feature of tracking- The technology has advanced so much that one can now easily track the move through certain applications on the mobile or other techniques. There are many transportation companies that have the facility of monitoring the move from the place of loading to the final destination. It is very important to stay on the top and see where your boat has reached. Thus, the best carriers are the perfect communicators. 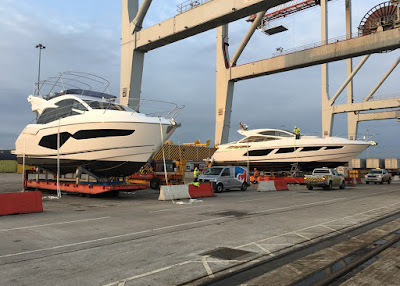 Facility of insurance- Though one may have the boat personally insured but this insurance goes invalid as one needs a cover against any professional transportation damages. There are many boat loader plans which should be analyzed properly to get to know about the insurance cover and the associated costs of the movement. Go with the feedback- Last but not the least, everyone must assure by getting the feedback either by the word of mouth from friends or by checking the review section of the website of the concerned company before making the final selection. One can also check their background by certain websites for if any complaints have been registered against them. All these above discussed points will release the stress and pressure of getting stuck in searching the best and perfect transportation company. A good communication with the boat hauler will bring clarity of shipping needs and successful shipping. Discuss everything with them, all points especially the payment procedure and the final cost without any hidden expenses. Ask clearly about the loading and unloading process done by them. This will help you do the final preparations with your boat in order to avoid any sort of damages on the way. Happy shipping! !